The sun beat down on us as we sat in Shamu Stadium waiting for the Believe show to start at Sea World San Diego. With a few minutes to kill before show time, I watched the vendors hawking toys, over-sized Sea World novelty cups, ice cream and assorted foods. Suddenly behind me over my left shoulder I heard a commotion and turned just in time to see a red vested vendor dump his entire tray of popcorn bags onto the aisle steps. A couple bottles of Pepsi he was trying to balance under the popcorn tray toppled over as well. I felt for him. Blistering heat, big crowds and only a few precious minutes to make a sale, but now any potential profit he makes is bouncing down the steps. From my right I saw a flash of red making its way up the same aisle steps. 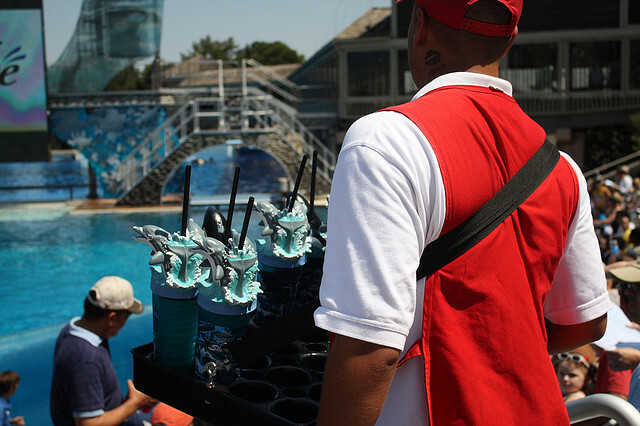 It was another vendor who was working the ground level of the stadium selling Sea World themed toys. He saw what happened to his fellow red vest and made a beeline towards him. He urgently excused his way through the crowd. Still holding his own tray, he bent down to gather the mess of remaining popcorn bags. When the last bag was back in place on the tray, the popcorn vendor bobs his head in thanks to his fellow vendor. At first, this mishap seemed like a small thing, but as I thought about it more I realized how extraordinary it was. We’re taught to look out for ourselves. We’re taught to compete. The vendor’s job is to sell stuff to the crowd. A successful day means sales and profits. It’s a tough job because the people you are attempting to convince to buy your product have already spent a lot of money to be in the park. Those same people have a variety of choices when it comes to spending their limited funds. Rarely will a person buy toys plus drinks plus popcorn plus sunshades plus ice cream before a show. Realistically, people will buy from one maybe two vendors simply because they can’t afford more. The vendor who came to the rescue gave up his opportunity for sales so that he could help out a colleague in need. That’s pretty rare, but that’s exactly the spirit and attitude we are trying to foster in the team members we lead. Create a sense of cooperation. We’re trying to move those we lead to embrace taking one from the team to taking one for the team. The leader’s job is to create a sense of cooperation among team members in order to fulfill the vision. Sure, that day the toy vendor probably lost a sale or two, but what he gained was greater in the long run, the trust of his colleague. Success for him that day was not found in the counting of profits, but in the knowledge that he was a team member who could be counted on to help out when needed. The day may come when the circumstance is reversed and the toy vendor needs the popcorn vendor’s help. When it does, it will be the popcorn vendor who can be counted on to help. When cooperation exists, a team is one step closer to achieving their goals. As a leader, what are some things you do to foster cooperation among your team members? I’d love to hear your thoughts. You are invited to check out my inspirational blog at http://www.ignitinghopetoday.com/ for encouragement to energize your day. Helping speakers improve their craft. In life, expect the unexpected! Making the most of every new day! Essential Insights. Great Debates. Informed Opinions. Twentysomething. Annoyed with corporate BS. Obsessed with Gen Y. Not bratty. Just opinionated.